Here’s one of the affordable promo from Smart prepaid where you can enjoy unlimited text to all networks and unli Tri-net calls (Sun Cellular, Talk N Text and Smart) good for 1 month. The new UCT 350 only cost you 350 pesos for 30 days plus you also get 500MB of internet surfing to any of your favorite websites. Just follow below mechanics if you want to register to this promo. 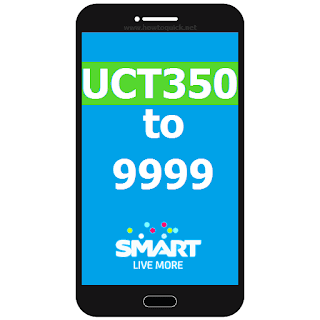 The new Smart UCT350 now with added unlimited call service to PLDT telephone numbers nationwide. You can now dial any area code as long as they are using PLDT landline without additional call charges while registered to this promo. Also available in UCT200, a way much cheaper option. You can also subscribe to this promo via Smart USSD menu *121#. Just select option number 6 for Unli offers then choose Unli Call and Text 350. Just make sure you have enough balance before you proceed to this transaction. Once registration is successful you will receive a SMS reply from Smart saying that your UCT350 promo is already active and ready to use. What to dial to access the call service? If you are registered with UCT350, just dial the 11-digit mobile number directly. This is similar to UNLI600 promo. Promo for UCT350 ends by September 30, 2016.
every time I make calls it ends right away.. ever since I started this promo, usually every night.. This is a great deal but sometimes poor service. may free viber ba ito in 1 month? how to call pldt numbers?